How do you take notes in Org? Are you buried in a heap of uncategorized notes? Do you manually open the right file and navigate to the right heading? Are you mystified by org-capture and org-refile? Here’s a path that can help you learn how to more efficiently take (and organize!) notes in Org Mode. Instead of using C-x C-f (find-file) all the time, set up shortcuts to jump to the Org files you use the most. This way, you can easily type that keyboard shortcut, go to the end of the file, and add your note. Here’s some sample code that sets the C-c o shortcut to open organizer.org in your home directory. You can add it to your ~/.emacs.d/init.el and then call M-x eval-buffer to load the changes. You can then jump to it with C-x r j (jump-to-register), specifying o at the prompt. Once you’re in your Org file, you can use M-> (end-of-buffer) to go to the end of the file, or you can use C-s (isearch-forward) to search for some text. You’ll still need to switch back to your original buffer or window configuration when you’re done, but that’s something you can fix when you learn how to use org-capture. The next improvement is to use org-refile to move the current subtree to a specified heading, or jump to one without moving any text. This will let you quickly go to a project or task from anywhere in Org Mode. By default, org-refile will show you only the top-level headings of the current file. Let’s configure it to show you headings from all your agenda files. You can use M-x customize-variable to change org-refile-targets. Click on the INS button, then click on Value menu next to Identify target headline by. Change this to Max level number. In the Integer field, fill in a suitably high number, like 6. This is the maximum depth of headings that will be shown. If you prefer to set your variables using Emacs Lisp, here’s the code that you can add it to your ~/.emacs.d/init.el. Call M-x eval-buffer to load the changes. Be sure to add your main Org Mode file to your agenda list. You can do so by going to the file and typing C-c [ (org-agenda-file-to-front), or by setting the org-agenda-files variable. By default, it moves the current subtree to the specified location. If you call it with the prefix argument C-u (like so: C-u C-c C-w), it jumps to the specified location instead of moving the current subtree. If you call it as C-u C-u C-c C-w, it jumps to the previous refiling location. First, practise using it with the prefix argument (C-u C-c C-w) to jump to a location. Once you’ve gotten the hang of that, go to some of your uncategorized entries and use org-refile without the prefix argument (just C-c C-w) to move the entries to the right place. org-refile gives you a quick way to jump to a heading, but you still have to find your way back to whatever you were working on before you wanted to take a note. After you’re comfortable with refiling notes to the right place, move on to learning how to use org-capture to quickly take notes from anywhere. org-capture can help you take notes quickly by popping up a window or leading you through prompts. When you’re done taking the note, it will return you to whatever you were looking at before you started. In order to take advantage of this, though, you’ll need to customize org-capture. The Org Mode manual recommends giving org-capture a global keyboard shortcut such as C-c c.
Make sure that the file exists and is automatically opened in Org Mode. If you type C-c c, org-capture will display a prompt. t is a simple task template, and C will show you the customization interface for org-capture-templates. Let’s start with t. It will show you a buffer with a simple TODO entry. You can fill in the rest of the details, use C-c C-s (org-schedule) to schedule it for a particular day, set the deadline with C-c C-d (org-deadline), etc. You can change the TODO keyword or delete it. When you’re done, type C-c C-c to automatically save it to your default notes file (as specified by org-default-notes-file). Changed your mind? Cancel with C-c C-k. After either C-c C-c or C-c C-k, you should be back to whatever it was that you were working on. Practise using C-c c (org-capture) to quickly jot down several tasks or notes. Then go to your notes file and use C-c C-w (org-refile) to move the notes to the right place. You can also refile the notes right from the capture buffer. Instead of typing C-c C-c to finish your note, use C-c C-w to refile it. 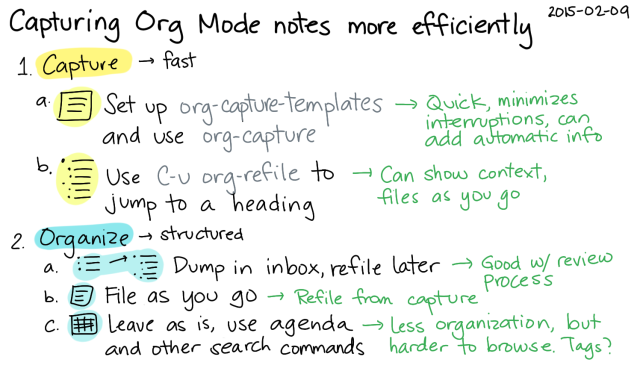 Get the hang of using org-capture to take notes, organizing them every so often (maybe at the end of your day, or once a week?) or refiling them as you go. If you find yourself capturing different kinds of notes often or you want to capture in another format (table entry? list item? ), invest the time in customizing org-capture-templates. In the beginning, you might find the Customize interface you get from M-x customize-variable org-capture-templates to be easier to work with than setting the values in plain Emacs Lisp, since the Customize interface lists the options. Read the documentation and look at examples of how other people have configured their org-capture-templates for more ideas. I have quite a few templates defined in my config, and http://doc.norang.ca/org-mode.html has a number of templates too. org-capture and org-refile are great when you’re at your computer, but what if you’re away? Quite a few people use MobileOrg to take quick notes on the go. I haven’t gotten around to setting that up for my workflow properly; instead, I use Evernote to jot quick notes on my phone. As part of my weekly review process, I look at the notes in my Evernote inbox and copy them into Emacs as needed. You can manually copy information from your preferred non-Emacs note-taking tools, or you can figure out an automatic way of doing so. For example, I have some code to copy Evernote notes titled “Journal” into an Org Mode file structured by year-month-day. Here’s a quick sketch showing some of your workflow options when it comes to capturing and organizing information with Org Mode. Which combination do you prefer, and how could you make it even better?